In 2018, Bill was presented with the Larry Foster Award for Integrity in Public Communication by the Arthur W. Page Center. In 2014, the Franklin Institute awarded him the Bower Award for Business Leadership. He was elected to the National Academy of Engineering in 2012. He has been named one of “Top 25 Business Leaders of the Past 25 Years” by PBS; “Executive of the Year-2001” by the Academy of Management; and “Director of the Year-2001-02” by the National Association of Corporate Directors. 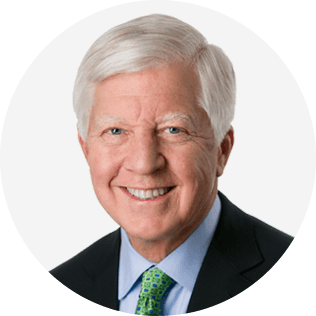 Mr. George is a CNBC Contributor and has made frequent appearances on television and radio. This session will focus on how leaders are changing today and what coaches need to do to help them become more authentic, starting with their life stories and their crucibles, and how coaches can help them discover their True North. It will then focus on the areas of coaching and development required for them to become authentic leaders: Self-awareness/EQ, practicing your values, finding your Sweet Spot, building a support team, leading an integrative life, the journey from I to We, and knowing your leadership purpose. 1. To become an authentic leader, you must develop yourself through who you are, not what you are. This means avoiding the pressures and seductions of the external world by grounding yourself in your authenticity and your True North. 2. Helping leaders understand the meaning of their life stories and framing their crucibles to find the positive aspects of them is essential for coaches to enable them to lead through crises, failures and disappointments while maintaining their authentic selves. 3. Ultimately, the coach’s most important role is to enable leaders to discover their True North, find their Sweet Spot and discern the purpose of their leadership.